Blessed Reginald of Orleans, Dominican, a former professor in Paris, came to preach there in the streets. The second Dominican General, Blessed Jordan of Saxony, a compatriot of Albert and a very eloquent preacher, was in Padua, and when the students of Bologna were transferred there Albert heard him at the Padua Dominican Church. He had already desired to enter the Order, but his uncle opposed to that plan a very vigorous opposition, and Albert was still very young. He dreamed one night that he had become a Dominican but left the Order soon afterwards. The same day he heard Master Jordan preach, and the Dominican General spoke of how the demon attempts to turn aside those who want to enter into religion, knowing that he will suffer great losses from their career in the Church; he persuades them in dreams that they will leave it, or else they see themselves on horseback, or clothed in purple, or as solitaries in the desert, or surrounded by cordial friends; thus he makes them fear entering because they would not be able to persevere. This was precisely Albert's great concern, faced as he was with his uncle's opposition. Afterwards the young student, amazed, went to Blessed Jordan, saying: Master, who revealed my heart to you? And he lost no time then in entering the Order at the age of sixteen, in 1223, having heard the same preacher remark to him personally that he should consider what a pity it would be if his excellent youthful qualities became the prey of eternal fires. When he had earned the title of Doctor in theology, he was sent to Cologne, where for a long time his reputation attracted many illustrious disciples. 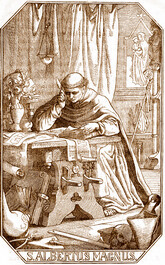 The humble Albert, filled with the love of God, taught also in Padua and Bologna, in Saxony, at Fribourg, Ratisbonne and Strasbourg, and when Blessed Jordan of Saxony died in 1237, he occupied his place and fulfilled his functions until 1238, when the election of his successor was held. He returned then to Cologne, where he would encounter a disciple who alone among all of them would suffice for his glory  Saint Thomas Aquinas. This young religious, already steeped in the highest theological studies, was silent among the others, to the point of being called by his fellow students the Mute Ox of Sicily. But Albert silenced them, saying, The bellowings of this ox will resound throughout the entire world. He was no longer young when he had to submit to the formal order of the Pope and accept, in difficult circumstances, the episcopal see of Ratisbonne; there his indefatigable zeal was rewarded only by harsh trials, in the midst of which his virtue was perfected. When, in response to his persevering requests to be relieved of the responsibilities of a large see, Pope Urban IV restored to him the conventual peace of his Order, he was nonetheless obliged to take up his apostolic journeyings again. Finally he could enter into a definitive retreat, to prepare for death. One is astonished that amid so many labors, journeys and works of zeal, Albert could find the time to write on the natural sciences, on philosophy and theology, works which form from twenty-one to thirty-eight volumes, depending on the edition  and one may ask in which of his titles he most excelled, that of scholar, of Saint, or of Apostle. He died, apparently of fatigue, at the age of seventy-three, on November 15, 1280, and his body was buried in Cologne in the Dominican church. He had to wait until December 16, 1931 for the honors of canonization and the extension of his cult to the universal Church. Proclaiming his holiness, Pope Pius XI added the glorious title, so well merited, of Doctor of the Church. From time immemorial, he has been known as Albert the Great. Labor as a good soldier of Christ Jesus.